Ireland’s highest mountains lie to the south of the country, and are mainly of sandstone though the Wicklow Mountains including Lugnaquilla are of volcanic origin. All these mountains were born of immense and varied geological forces. 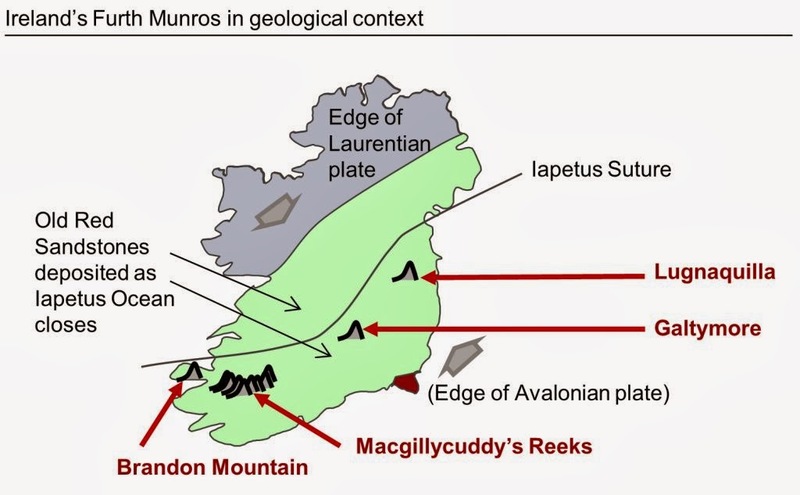 About 420 million years ago, tectonic movements had caused the collision of the Laurentian and Avalonian plates bearing the originally separate northern and southern parts of Ireland [see the animation here]. The intervening Iapetus Ocean was eventually squashed shut; and into the resulting basin rivers deposited rock / sand [375 m yago]. Then a further plate – bearing what we now call Southern Europe – bumped northwards into the plate bearing the recently-assembled Ireland [300 m yago]. This compressed and buckled the sandy deposits creating folded ranges that include Macgillycuddy’s Reeks and the Galtee Mountains including Galtymore. 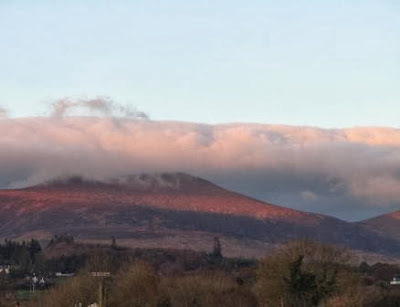 The friction of such seismic events caused deep-seated magma to well up in volcanic hot-spots to create mountain ranges such as the Wicklow Mountains including Lugnaquilla. These latter mountains are thus mainly of granite, albeit with remnants of the rocks that had originally covered them. Of course, like mountains everywhere, most of the dramatic features have been dug by fault-lines and then carved more recently [in the last 1.7 m years] by the abrasion of ice, the gnawing of Ice Age freeze-thaw, and the drip-drip erosion by rain. 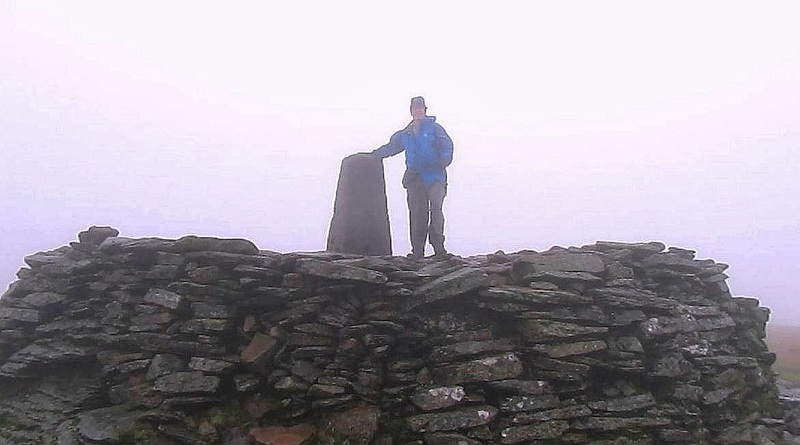 Four stops on a simple loop from Dublin means that you can climb the Furth Munros in four or possibly five days. 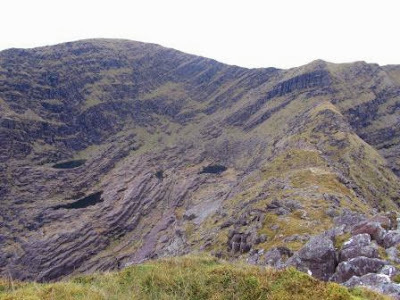 Or you could of course combine these climbs with broader adventures on other beautiful mountains in Ireland. Wicklow National Park allows camping. Emerging from our tents near the secluded Boravore car park at T066942, we hailed and then latched on to a party of other walkers. John, their leader, had climbed this mountain more than 100 times (!) and we followed his confident lead up a steep and occasionally completely overgrown path, heading westwards and immediately uphill from the car park. Having climbed a deep gully, we reached rolling pathless moorland, a flattish green plateau, and then a curve southwards to approach the summit at T032917. The summit perches between two glacial corries (the North and South Prisons; be careful as the former is a military firing range). 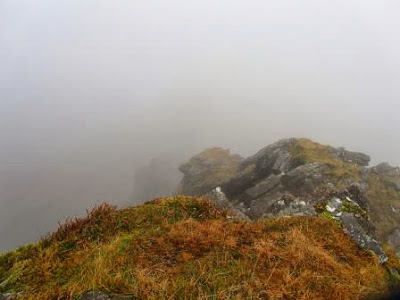 Alas the mists descended, so the reputed views across the Irish Sea to Snowdonia remained hidden. We retuned via Art’s Lough and the track that returned to the car park (and by which less adventurous walkers may approach the summit). 13km; 900m guidebooks suggest 5 hours; we took 3:45 hours. All timings exclude breaks. There are many other routes up this hill. We overnighted at Castlegregory (and the beautiful Dingle peninsula offers many a B&B) then started from the car park (Q493 119) just past Cloghane. There is a lower Pilgrim’s Path that enters the corrie then claws its way to the summit at Q460116 so that pilgrims can pay homage to Saint Brendan who, according to texts of circa 900AD, crossed to North America in a coracle four hundred years earlier. [He may in fact have reached Iceland.]. 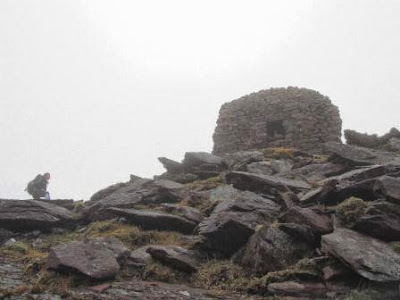 The summit bears a cross and offers panoramic views over the fractal coastline of Dingle and is reputedly the last spot in the British Isles to be illuminated by the setting sun. 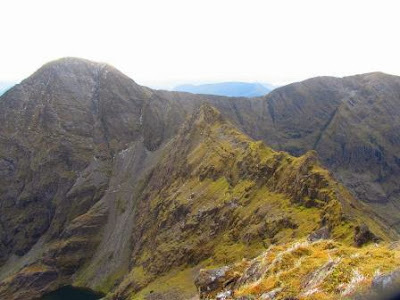 There are several routes of ascent and descent; we chose to descend by circling southwards via the “fangs” ridge that includes Brandon South Top and Brandon Peak , before dropping to meet a track that runs back towards Cloghane; a short-cut limits the road walking to 5 km. 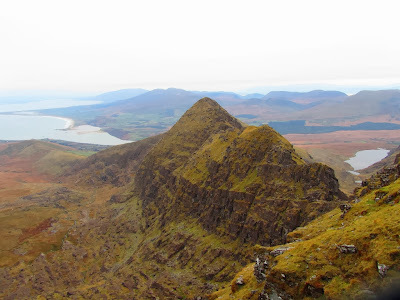 Preferring the beauty of full daylight views of the Reeks rather than the bravura of a single traverse of the full range that would have been partly in the dark at this time of year, we decided to walk the range in two parts. We had stayed at Cronin’s Yard, the 200-year old base from which to climb Ireland’s highest peaks. It’s worth a Google. The western horseshoe is a well-known classic route that takes in Ireland’s Mount Everest, K2 and Kanchenjunga – together with the ‘interesting’ Beenkeragh ridge. We started from the new car park – which may not appear in reports older than 2011 – at approximately V771 873, then SE up the concrete ‘Hydro Road’ that lets you gain altitude quickly. Our route was clockwise though others on this day went the other way and there seems little to choose between the two directions. From a wee lochan we gained the ridge which affords continuous views down to the joined ‘Siamese loughs’ beneath. The going was not too hard at first, and Caher West Top [the 5th highest mountain in Ireland], Caher [#3], and Carrauntoohil [#1] were easily attained. The crossing to Beekeragh is more risky and it’s worth taking detailed instructions with you. We were clambering on narrow ledges, holding on tightly, stepping down carefully lest footings should give way, and glad to have printed directions when too many options, all equally enticing, beckoned us onwards. We took great care across The Bones [#7] aka Carrauntoohil Tooth and unsure which was its true needle to be climbed, climbed all candidates before eventually reaching Breekeragh [#2]. Relative safety prevailed thereafter as we looped back down the wee lochan, glancing periodically back at the stunning ridges, peaks, and surrounding lands. From Cronin’s Yard we headed up the track towards the Reeks, cutting left to traverse virgin moorland, pulled on by the just-visible grotto atop Cruach Mhor. We rounded the Lake of the Serpents, and reached the grotto with its Madonna. In the cold and mist now, we continued on along the rocky ridge with towers to be negotiated by hard-ish scrambling to the pinnacle that is the Big Gun. The rocky spine continued to Cnoc na Peiste, but the route eased thereafter to Maolan Bui, and Cnoc an Chuillin. Evocative names loomed ahead. We declined the heavily eroded Devil’s Ladder in favour of the Zig-Zags, to reach Hag’s Glen and then passed beneath the Heavenly Gates to reach the Yard again. The Galtee range rises steeply from the surrounding plain, its highest mountain a Munro by just 15 feet. We left the accommodation at Cahir early and started our climb from the top end of the Black Road, which leaves the R639 just east of the village melodically-named Skeheenaranky. Not wishing to miss our travel connections, we covered the 9.6 km and 650 metres of ascent in 2 hours 15 minutes thanks to the track that leads 75% of the way to the summit, and despite the peat hags, which were relatively dry. We did have time, however, peer several times down the mountain’s sheer north face and into the corrie beneath. Allow three hours on this route if you are not in a hurry, but there are other longer routes to be found. Though ‘a quickie’, Galtymore provides great views when the weather allows, both from its summit, and from the lower plain on which its stands proudly facing of Knockmealdown which is 100 metres shorter but does not look it. We found the guidebook useful: The Dingle, Iveragh & Beara peninsulas: A Walking Guide by Adrian Hendroff.